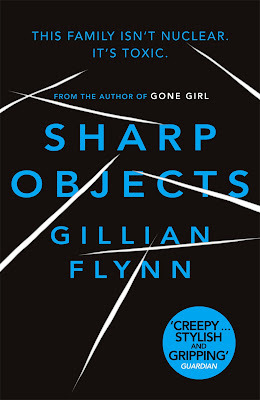 I, like many others girls throughout the past year, read the book Gone Girl by Gillian Flynn. I'm typically a fan of thrillers, especially the ones that end every chapter with the realization that you're not moving from your couch for the next couple of hours because you have to turn to the next page. Such was the case with Gone Girl, but with Flynn's other book, Sharp Objects, the thrill just wasn't there. However, the nightmares definitely were. I've never read a book that would affect my dreams so often. The plots reads as a typical suspense novel with a little bit of horror wrapped in: Journalist girl in a big city returns home to her small town to cover the murder of two little girls, but somehow gets wrapped up in solving the mystery and learning a few not-too-pleasant details about her family and childhood. The ending was mostly predictable and I grew to hate the main character, as well as strongly question the sanity of Flynn herself (as if I didn't already from reading Gone Girl). All in all, I'd recommend Gone Girl any day, but Sharp Objects was definitely subpar. I looooved Gone Girl. Thanks for the review on her follow up. I think i'll pass! I've heard great things about Orange is the New Black. Have you read that one?